Whaddaya Mean I Can’t Deploy My SharePoint App? After applying some recently-released patches for SharePoint 2013, my farm’s App infrastructure went belly-up. This post describes my troubleshooting and resolution. I’ve been doing a lot of work with the new SharePoint 2013 App Model in the last few months. Specifically, I’ve been working on a free tool (for Idera) that will be going into the SharePoint App Marketplace sometime soon. The tool itself is not too terribly complicated – just a SharePoint-hosted app that will allow users to analyze library properties, compare library configuration settings, etc. The development environment that I was using to put the new application together had been humming along just fine … until today. It seems that I tempted fate today by applying a handful of RTM patches to my environment. After all binaries had been installed and a reboot was performed, I ran the SharePoint 2013 Products Configuration Wizard. The wizard ran and completed without issue, Central Administration popped-up afterwards, and life seemed to be going pretty well. Error occurred in deployment step ‘Install app for SharePoint’: We’re sorry, we weren’t able to complete the operation, please try again in a few minutes. If you see this message repeatedly, contact your administrator. Okay, I thought, that’s odd. Let’s give it a second. Three failed redeploys later, I rebooted the VM to see if that might fix things. No luck. My development wasn’t moving forward until I figured out what was going on, so I did a quick hunt online to see if anyone had encountered this problem. The few entries I found indicated that I should verify my App settings in Central Administration, so I tried that. Strangely, I couldn’t even get those settings to come up – just error pages. All of this was puzzling. Remember: my farm was doing just fine with the entire app infrastructure just a day earlier, and all of a sudden things were dead in the water. Something had to have happened as a result of the patches that were applied. 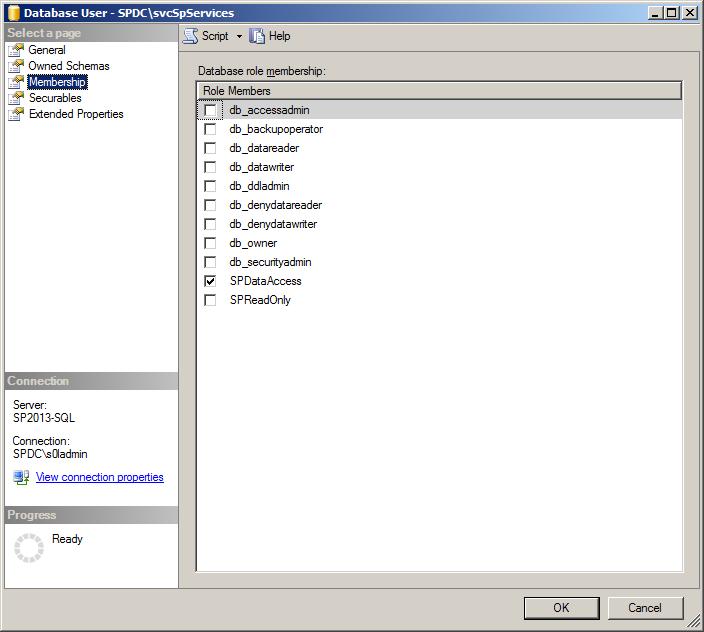 Insufficient SQL database permissions for user ‘Name: SPDC\svcSpServices SID: S-1-5-21-1522874658-601840234-4276112424-1115 ImpersonationLevel: None’ in database ‘SP2013_AppManagement’ on SQL Server instance ‘SpSqlAlias’. Additional error information from SQL Server is included below. The EXECUTE permission was denied on the object ‘proc_GetDataRange’, database ‘SP2013_AppManagement’, schema ‘dbo’. Seeing that my service account (SPDC\svcSpServices) didn’t have the access it needed to run the proc_GetDataRange stored procedure left me scratching my head. I didn’t know what sort of permissions the service account actually required or how they were specifically granted. So, I hopped over to my SQL Server to see if anything struck me as odd or out-of-place. Looking at the SP2013_AppManagement database, I saw that members in the SPDataAccess role had rights to execute the proc_GetDataRange stored procedure. SPDC\svcSPServices didn’t appear to be a direct member of that group (that I could tell), so I added it. Bazinga! Adding the account to the role permitted me to once again review the App settings in Central Administration. Insufficient SQL database permissions for user ‘Name: NT AUTHORITY\IUSR SID: S-1-5-17 ImpersonationLevel: Impersonation’ in database ‘SP2013_AppManagement’ on SQL Server instance ‘SpSqlAlias’. Additional error information from SQL Server is included below. The EXECUTE permission was denied on the object ‘proc_AM_PutAppPrincipal’, database ‘SP2013_AppManagement’, schema ‘dbo’. It was obvious to me that more than just a single account was out of whack since the proc_AM_PutAppPrincipal stored procedure was now in-play. Rather than try to manually correct all possible permission issues, I decided to try and get SharePoint to do the heavy lifting for me. Deleted my App Management Service Application instance (which I happened to call “Application Management Service”) in Central Administration. I checked the box for Delete data associated with the Service Applications when it appeared to ensure that I got a new app management database. 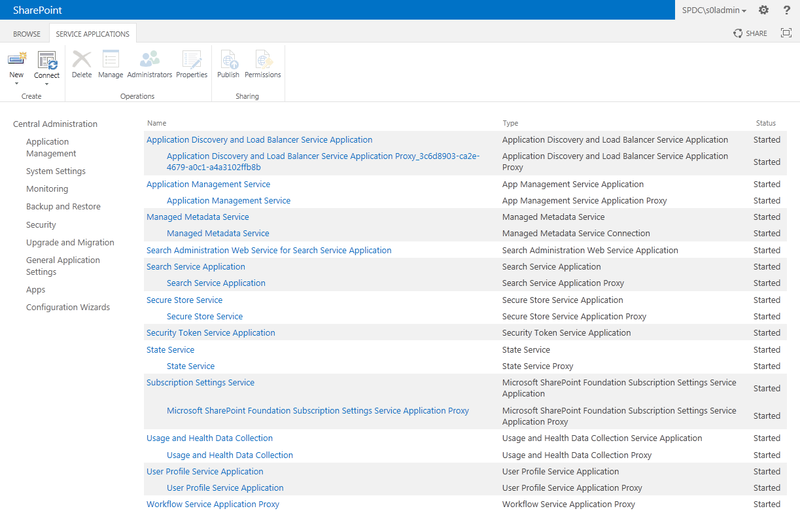 Once the service application was deleted, I created a new App Management Service service application. 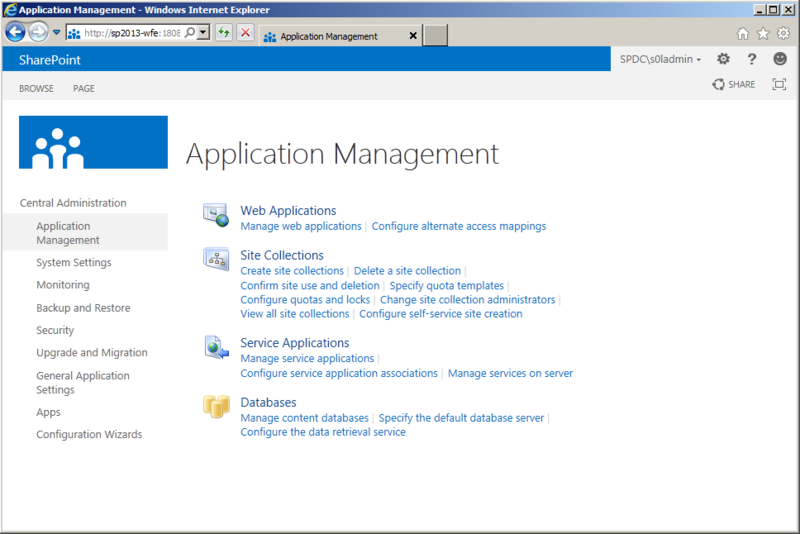 I named it the same thing I had called it before (“Application Management Service”) and re-used the same database name I had been using (“SP2013_AppManagement”). I re-used the shared services application pool I had been using previously, too. After completing these steps, I was able to successfully deploy my application to the development site collection through Visual Studio. 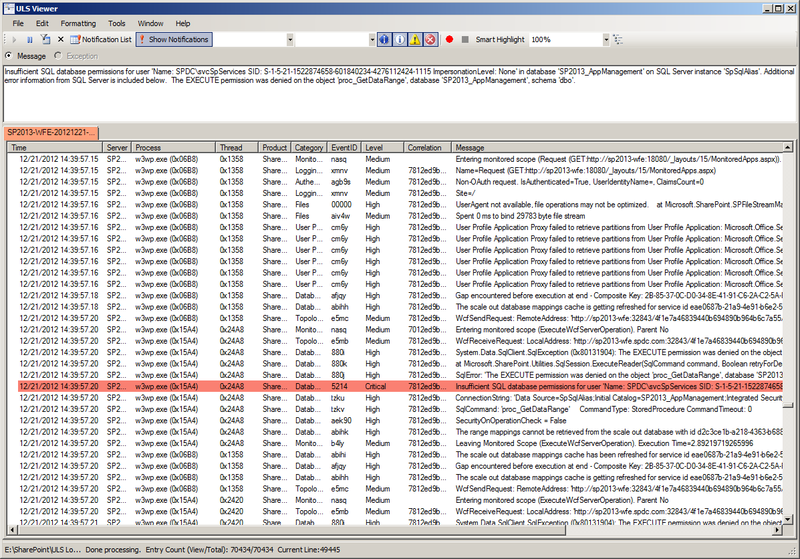 I no longer saw the stored procedure access errors appearing in the ULS logs. I don’t know what happened exactly, but what I observed seems to suggest that one of the patches I applied messed with the App Management service application database. Specifically, rights and permissions that one or more accounts possessed were somehow revoked by removing those accounts from the SPDataAccess role. Additional role and/or permission changes could have been made, as well – I just don’t know. 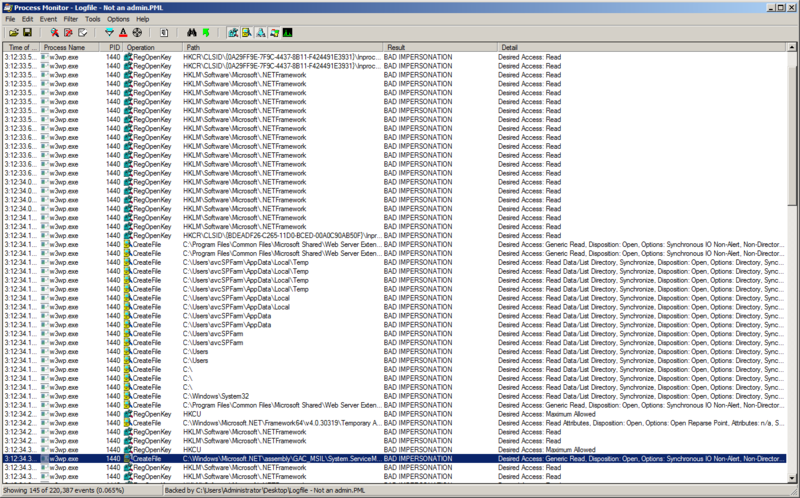 Once everything was running again, I went back into my SQL Server and had a look at the (new) SP2013_AppManagement database. Examining the role membership for SPDC\svcSpServices (which was one of the accounts that was blocked from accessing stored procedures earlier), I saw that the account had been put (back) into the SPDataAccess role. This seemed to confirm my observation that somehow things became “unwired” during the patching and/or configuration wizard run process. Author Sean McDonoughPosted on December 21, 2012 December 21, 2012 Categories Administration, DevelopmentTags Apps, database, Idera, security, service applications, SP201313 Comments on Whaddaya Mean I Can’t Deploy My SharePoint App? After installing the current SharePoint 2013 preview build, I was greeted by “An unexpected error has occurred” message while trying to navigate to the Central Administration site. This post represents the steps I took to troubleshoot the problem and implement a least-privileges fix for it. 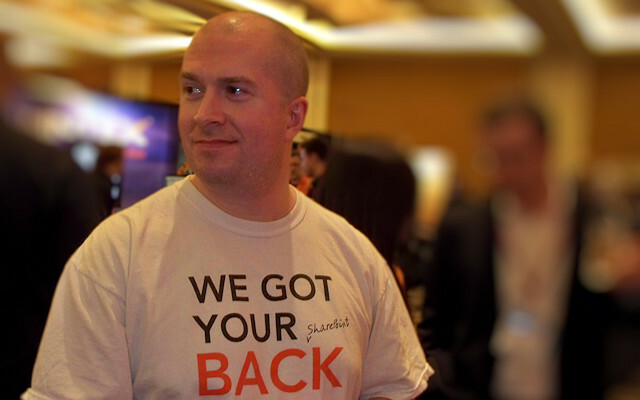 You’ve undoubtedly heard the news: SharePoint 2013 is coming. The preview is available right now, and you can download it from TechNet if you want to join in the fun. Just make sure you can meet the hardware and environmental prerequisites. They’re somewhat brutal. As you might have guessed from the title of this post, I’ve been trying to get in on the SharePoint 2013 fun. There are a number of things I’m supposed to be working on for SharePoint 2013, so building out a SharePoint 2013 environment with the new preview build has been high on my list of things to do. This post is about a very recent experience with a SharePoint 2013 installation and configuration … and yes, it’s one that had me looking long and hard for a happy pill. As with many of my other blog posts, this post takes a winding, iterative approach towards analyzing problems and trying to find solutions. Please bear with me or jump to the “Implementing the Change” section near the end if you want to blindly apply a change (based on the blog post title) and hope for the best. No such luck; just look at the screenshot on the left. Sometimes I feel like I’m a magnet for “bad technology karma” despite my attempts to keep a clean slate in that area. Of course, SharePoint 2013 is only in the preview stages of release, so hiccups are bound to occur. I accept that. Like many of you, I went through it with SharePoint 2010 and SharePoint 2007, as well. That’s it. No additional information, no qualification – just a technological “whoops” accompanied by the equivalent of a shoulder shrug from my VM environment. Let me take a step back to describe the environment I had put into place before trying to install and configure the SharePoint 2013 binaries. Overkill? Perhaps, but I wanted to get a feel for how the different components might interact in a “real” production environment. I also opted for a least privileges install so that I could start to understand where some of the security boundaries had shifted versus SharePoint 2010. Since I planned to use the farm for my development efforts, I didn’t want to make the common developer mistake of shoehorning everything onto one server with unrestricted privileges. 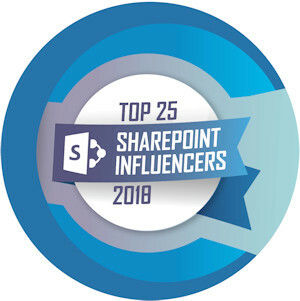 Such an approach dodges security-related issues during development, but it also tends to yield code that falls apart (or at least generates security concerns) upon first contact with a “real” SharePoint environment. As stated earlier, my setup problems started after I installed the SharePoint 2013 bits and ran the SharePoint 2013 Products Configuration Wizard. The browser window that popped-up following the configuration wizard’s run was trying to take me to the Farm Configuration wizard that lives inside the Central Administration site. Clearly I hadn’t gotten very far in configuring my environment. Maybe it was my go ‘rounds with previous SharePoint beta releases, or maybe it was a combination of Eric Harlan’s and Todd Klindt’s spirits reaching out to me (the point of commonality between Todd and Eric: the two of them are fond of saying “it’s always permissions”). Whatever the source, I decided to start playing around with some account rights. Since I was setting up a least-privileges environment, it made sense that rights and permissions (or some lack of them) could be a factor. The benefit of having gotten nearly nowhere on my farm configuration task was that there wasn’t much to really troubleshoot. Only a handful of application pools had been created (as shown on the right), and only one or two accounts were actually in-play. Since my Central Administration site was having trouble coming up, and knowing that the Central Administration site runs in the context of the farm service/timer service account, I focused my efforts there. In my farm, I had assigned SPDC\svcSPFarm for use by the timer service. This account was a basic domain account at the start – nothing special, and no interesting rights to speak of. To see if I could make any progress on getting the Central Administration site to come up, I dropped the account into the Domain Admins group and tried to access the Central Administration site again. I repeated the process again, but the second time around I used the local (SP2013-WFE) Administrators group instead of the Domain Admins group. The results were the same: adding SPDC\svcSPFarm to the Administrators group allowed me to bring Central Administration up, and removing the account from the Admininstrators group brought things back down. Hunch confirmed: it looked like I was dealing with some sort of rights or permissions issue. Unfortunately, I don’t deal well with not knowing why something doesn’t work. It’s a personal hang-up that I have. So, I started with some low-impact/low-effort troubleshooting: I adjusted my VM’s Audit Policy settings (via the Local Security Policy MMC snap-in) to report on all failures that might pop-up. Unfortunately, the only thing this change actually did for me was reveal that some sort of WinHttpAutoProxySvc service issue was popping-up when SPDC\svcSPFarm wasn’t an administrator. After a few minutes of researching the service, I decided that it probably wasn’t an immediate factor in the problem I was trying to troubleshoot. So much for finding a quick answer. I knew that I needed to dig deeper, and I knew where my troubleshooting was going to take me next. Honestly, I wasn’t too excited. I dug into my SysInternals folder and dug out Process Monitor. For those of you who aren’t familiar with Process Monitor, I’ll sum it up this way: it’s the “nuclear option” when you need diagnostic information regarding what’s happening with the applications and services running on your system. 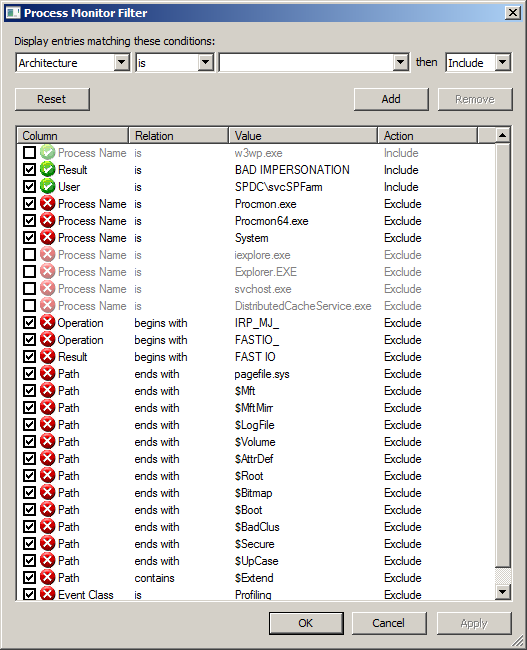 Process Monitor collects file system activity, Registry reads/writes, network calls – pretty much everything that’s happening at a process level. It’s a phenomenal tool, but it generates a tremendous amount of information. And you need to wade through that information to find what you’re looking for. I did an IISRESET, fired-up Process Monitor, and tried to bring up the Central Administration site once again. Since the SPDC\svcSPFarm account was no longer an administrator, I knew that the site would fail to come up. My hope was that Process Monitor would provide some insight into where things were getting stuck. Over the course of the roughly 30 seconds it took the application pool to spin-up and then hand me a failure page, Process Monitor collected over 220,000 events. I don’t know how you feel about it, but 220,000 events was downright intimidating to me. “Browsing” 220,000 events wasn’t going to be feasible. I’d worked with Process Monitor before, though, and I knew that the trick to making headway with the tool was in judicious use and application of its filtering capabilities. Initially, I created filters to rule out a handful of processes that I knew wouldn’t be involved – things like Internet Explorer (iexplore.exe), Windows Explorer (Explorer.EXE), etc. Each filter that I added brought the number of events down, but I was still dealing with thousands upon thousands of events. After a little thinking, I got a bit smarter with my filtering. First, I knew that I was dealing with an ASP.NET application pool; that was, after all, where Central Administration ran. That meant that the activity in which I was interested was probably taking place within an IIS worker process (w3wp.exe). 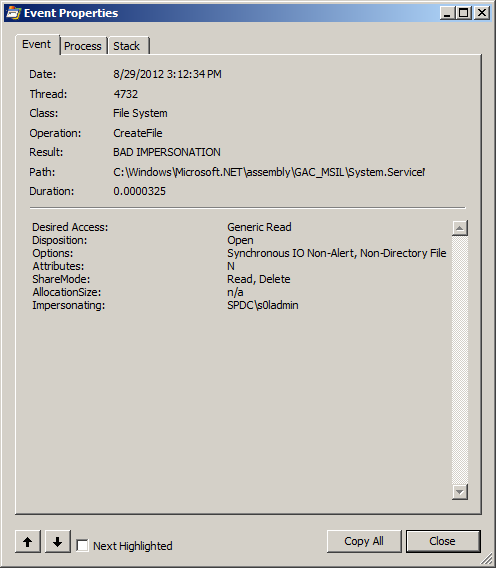 I set a filter to show only those events that were tied to w3wp.exe activity. Second, I knew that my farm service account (SPDC\svcSPFarm) was at the heart of my rights and permissions issue. So, I decided to filter out any activity that wasn’t tied to this account. Applying those two filters got me down to roughly 50,000 events. Excluding SUCCESS results dropped me to 10,000 events. Some additional tinkering and exclusions brought the number down even lower. I was still wading through a large number of results, though, and I didn’t see anything that I could put my finger on. Next, I decided to place SPDC\svcSPFarm back into the Administrators group and do another Process Monitor capture. As expected, I captured a few hundred thousand events. I went through the process of applying filters and whittling things down as I had done the first time. Then I spent a lot of time going back and forth between the successful and unsuccessful runs looking for differences that might explain what I was seeing. After doing a number of comparisons, I began to focus on a series of entries that were tagged with a result message of BAD IMPERSONATION (as seen below). I was seeing 145 of these entries (out of 220,000+ events) when the Central Administration site was failing to come up. When SPDC\svcSPFarm was part of the local Administrators group, though, I wasn’t seeing any of the entries. My gut told me that these BAD IMPERSONATION entries were probably a factor in my situation, so I started looking at them a bit more closely. Many of the entries were seemingly non-specific attempts to access the Registry, but I did notice a handful of file and Registry accesses where an explicit impersonation attempt was being made with the current user’s account context. In the example on the right, for instance, an attempt was being made by the worker process to use my account context (SPDC\s0ladmin) for a CreateFile operation – and that attempt was failing. This led to me formulate (what may seem like an obvious) hypothesis: seeing the BAD IMPERSONATION results, I suspected that the SPDC\svcSPFarm account was lacking something like the ability to replace a process-level token, log on interactively, or something like that. I’m certainly no expert when it comes to the specific boundaries and abilities associated with each rights assignment, but again – my gut was telling me that I should probably play around with some of the User Rights Assignments (via Local Security Policy) to see if I might get lucky. I popped open the Local Security Policy MMC snap-in on the SP2013-WFE VM once again, and I navigated down to User Rights Assignment node. At first glance, I feared that my gut feeling was off-the-mark. Looking through the rights assignments available, I saw that SPDC\svcSPFarm had already been granted the ability to Replace a process level token and Log on as a service – presumably by the SharePoint 2013 Products Configuration Wizard. I continued looking at the various rights assignments, though, and I discovered one that looked promising: Impersonate a client after authentication. SPDC\svcSPFarm hadn’t been granted that right in my environment, and it seemed to me that such a right might be handy in getting rid of the BAD IMPERSONATION results I was seeing with Process Monitor. I took a leap, granted SPDC\svcSPFarm the ability to Impersonate a client after authentication (as shown on the left), performed an IISRESET, and tried to reach the Central Administration site. And I’ll be darned if it didn’t actually work. I don’t normally get lucky like that, but hey – I wasn’t going to argue with it. I browsed around the Central Administration site for a bit to see if the site would remain responsive, and I didn’t notice anything out of the ordinary. I also performed an IISRESET and brought the Central Administration site back up with Process Monitor running just to double-check things. Sure enough, the BAD IMPERSONATION results were gone. I honestly have no idea whether this problem was specific to my environment or something that might be occurring in other SharePoint 2013 preview environments. I also don’t know if my solution is the “appropriate” solution to resolve the issue. It works for now, but I still have a lot of configuration and actual development work left to do to validate what I’ve implemented. Since I’m trying to maintain a least-privileges install, though, I’m willing to try this out for a while instead of falling back to placing my farm service account (SPDC\svcSPFarm) in the Administrators group. Placing the account in that group is a last resort for me. In case you were wondering: I did perform some level of verification on this change. Since the account I was running as (SPDC\s0ladmin) was itself a member of Domain Admins, I created a standard domain user account (SPDC\joe.nobody – he’s always my go-to guy in these situations) and added it to the Farm Administrators group in Central Administration. I then did an IISRESET and opened a browser to the Central Administration site from the domain controller (SP2013-DC) to see if SPDC\joe.nobody could indeed access the site. No troubles. The fact that the SPDC\joe.nobody account wasn’t a member of either Domain Admins or the local Administrators group (on SP2013-WFE) did not block the account from reaching Central Administration. No “An unexpected error has occurred” reared its head. On your SharePoint Server, go to Start > Administrative Tools > Local Security Policy to open the Local Security Policy MMC snap in. When the snap-in opens, navigate (in the left Tree view) to the Security Settings > Local Policies > User Rights Assignment node. 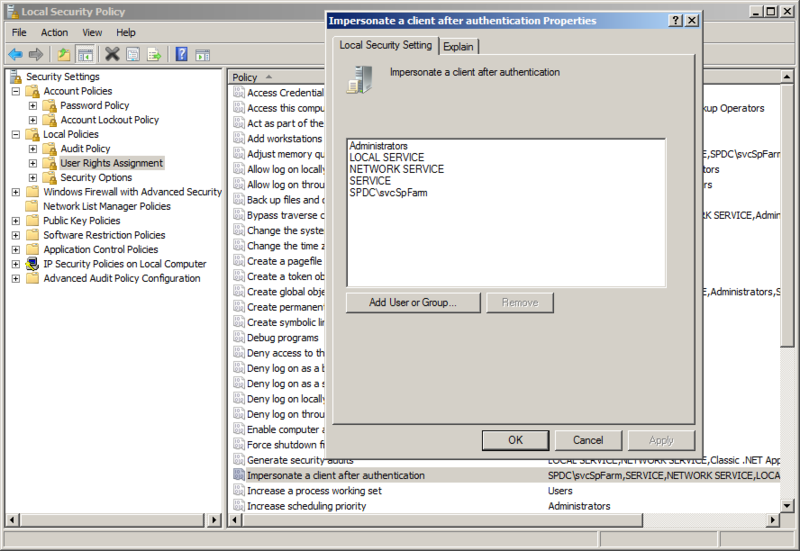 Locate the Impersonate a client after authentication policy in the right-hand pane. Right-click the policy and select the Properties item that appears in the pop-up menu. A dialog box will appear. Click the Add User or Group … button on the dialog box. In the Select Users, Computers, Service Accounts, or Groups dialog box that appears, add your farm service/timer service account. Click the OK button on each of the two open dialog boxes to exit out of them. Close the Local Security Policy MMC snap-in. If the change that I described in this post and implemented in my environment causes problems or requires further adjustment, I’ll update this post. My goal certainly isn’t to mislead – only to share and hopefully help those who may find themselves in the same situation as me. 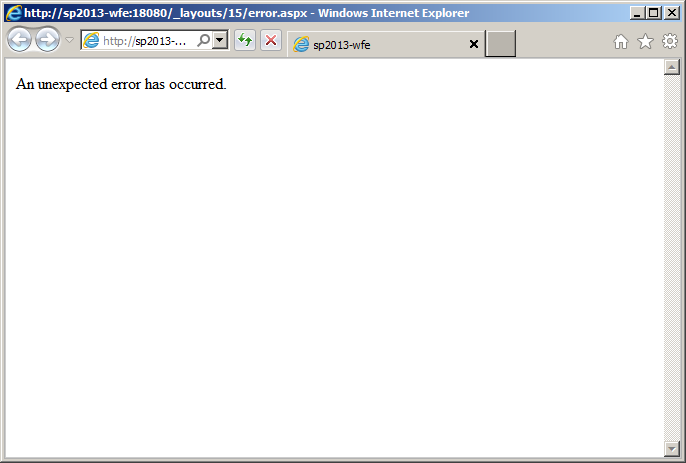 If you’ve seen this problem in your SharePoint 2013 preview environment, please let me know. I’d love to hear about it, as well as how your worked through (or around) it! At this point, I’m willing to bet that any other accounts that are assigned as application pool identities will need to be granted the Impersonate a client after authentication privilege, as well. The identity of application pool SharePoint – 80 is invalid. The user name or password that is specified for the identity may be incorrect, or the user may not have batch logon rights. If the identity is not corrected, the application pool will be disabled when the application pool receives its first request. If batch logon rights are causing the problem, the identity in the IIS configuration store must be changed after rights have been granted before Windows Process Activation Service (WAS) can retry the logon. If the identity remains invalid after the first request for the application pool is processed, the application pool will be disabled. The data field contains the error number. In my case, my account credentials were correct, but for some reason the Log on as batch job right hadn’t been assigned to the SPDC\svcSpContentWebs account. Each time the application pool tried to spin up, it failed and was stopped; I’d then get two warnings from WAS (5021 and 5057) in my System event log, and that would be followed by a WAS 5059 error.